have had the good fortune to partner with. floral honey harvested in the Valley in late May. In total there were five of us, which was good as we were able to share the load of harvesting and hauling the equipment. 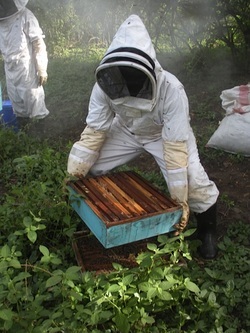 The hives in Lyanza are of two varieties. Top bar hives and Langstroth hives. Most of the Langstroth hives had the wires removed from the honey supers - the men like to squeeze the honey from the comb together with that from the top bar hives. Since this is the second time we harvested in the month of December, it is amazing to see how the queens cut back in laying and seem to just put up honey during this important nectar flow. Most of the hives we harvested from only had three to four brood combs in them and honey all around the brood chamber as well as any added super. We have very few of the hives with queen excluders. The bees seem to know just where we want the honey! Day after processing, together with Eliamu Mulungu one of the heads of Tree of Life, good yield of flavorful dark forest honey. Honey is the "primary vehicle" for helping this NGO meet its financial needs. When working with African bees be sure that you keep smoking the area you are working in to keep the bees in check. Smoke masks the bees alarm pheromone, diffusing a lot of aggression. 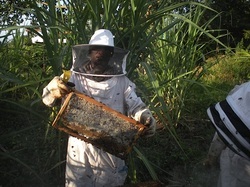 Thank you for taking time to read our update on the Lyanza village harvest here at Africanbeekeeping.com. We wish you happy beekeeping wherever you are in Africa! Please feel free to comment on our "comment page." I will get right back to you about questions or comments you make regarding beekeeping on this great continent! 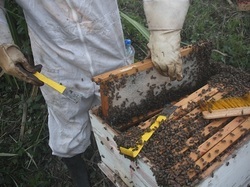 Hauling a heavy hive to the harvesting table. It is always a good idea to take a small table to the bush with you to harvest your honey on as it can get quite tiring for your back to bend over and work on hives placed on the ground. 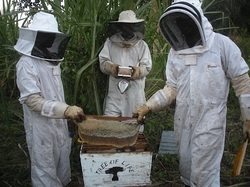 The “Tree of Life” NGO men harvest their honey. These men have been trained in harvesting and training others in beekeeping. I have great faith in the beekeeping work they are involved in and am fortunate to have worked with them these past years! greased to prevent Siafu ants from attacking the colonies. 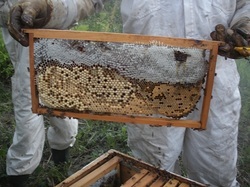 Mixed drone brood, worker brood and beautiful white-capped honeycomb. Ha, the rascals! 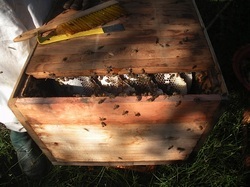 Even with starter strips affixed to our top bars they burr combed this hive. Beautiful capped comb. This is a box type hive with bars in it and it works great! Frenki with full-capped honey comb from the brood chamber of a Langstroth. Frenki banging excess bees off a Langstroth honey super before taking it to the truck. Amazing white capped honey comb in the brood chamber of our Lyanza hives.